Lines should have at least 0.25 inches of space between them in order to leave enough room to write. Edits are generally limited only by available space. Most templates already contain close to the maximum amount of information possible before the lines become too close together to comfortably write between. Therefore it is suggested that for the most part you do not request a lot more information to be included on a template than is already there. It's best to start by changing existing items before adding new ones. If you need even more info included but feel you may be running out of space, try looking at the design and decide if there are elements that you could do without. Little changes, such as removing a dividing line, can often free a good bit of space. 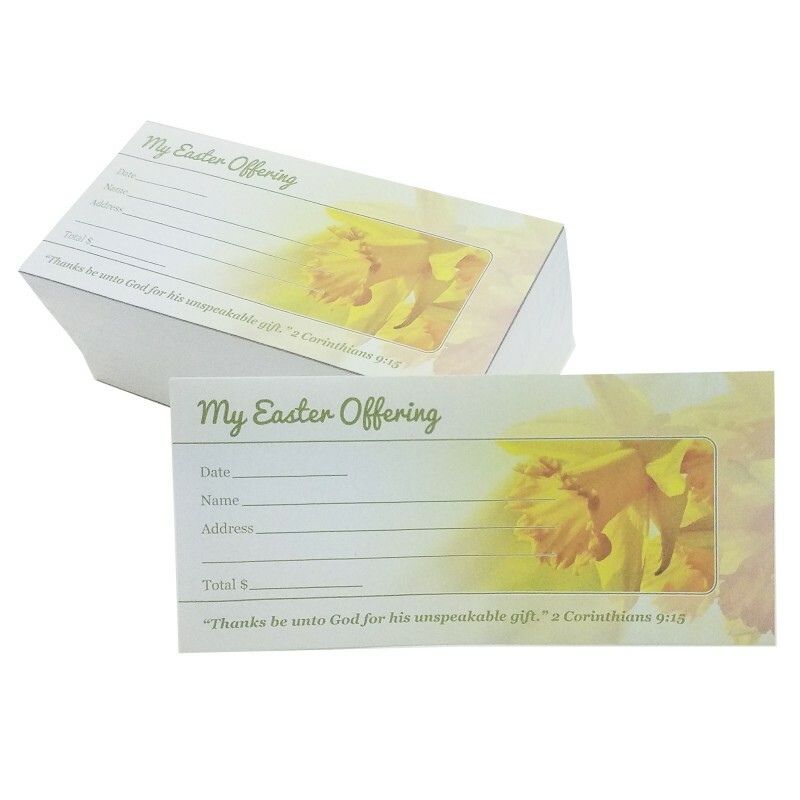 These beautiful Easter offering envelopes are great for any church! 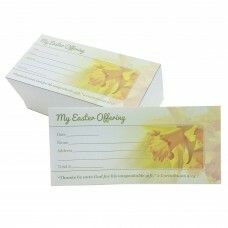 Make your Easter offering special this year with these beautiful, full color Easter offering envelopes! You have the option to customize with your church information, or order them as designed. Dimensions 6.5 " x 3" to fit personal checks and US currency. Fits in most pew racks. Other Printed on 20# bond. Envelope has one small glue spot for easy opening. Perforated tear-open tab for easy-opening. Box Bulk boxed by ~500. Orders of 5000 and over may have ~625 per box. What do you want changed on the envelope? We will email you with your personalized envelope for approval before we print.